Fully hosted, web-based solution for analyzing wholesale beef forward market data. Eliminate the need for on-site infrastructure with Boxed Beef 4-Ward's pricing platform. Introducing Boxed Pork 4-Ward - Now offering ratio basis forecasts on pork items at Boxed Pork 4-Ward! Boxed Beef 4-Ward Prime, the real-time, mobile pricing analytics solution and introducing Boxed Beef 4-Ward Select. Click here to learn about Boxed Beef 4-Ward Select. Do it all with Boxed Beef 4-Ward Prime! 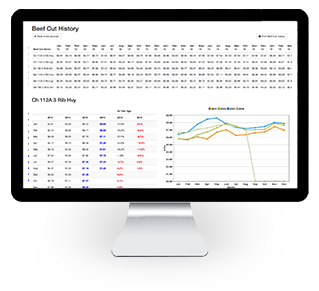 Access to real-time forward pricing analytics by beef cut calculated using CME Live Cattle Futures, USDA historical beef cut prices and Boxed Beef 4-Ward® proprietary ratio forecasts. Our proprietary ratio forecasts keep your assumptions on track with changing market dynamics. Access your custom workbook anytime, anywhere there is an internet connection. Convenient, easy and fast to use and share work product. Boxed Beef 4-Ward® is available as a monthly subscription including training and customer support. Let us take care of databases and forecasting while you focus on your business. To learn more, please contact us at info@boxedbeef4ward.com or call 1-844-244-9273 (1-844-BB4WARD).